We have a range of Universal Testing Machines. 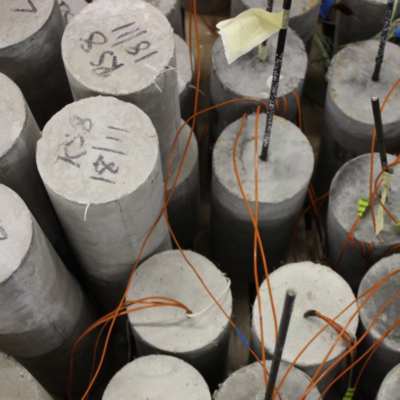 Their use includes strength tests on standard concrete and steel specimens, shear-friction tests on masonry, creep tests on steel at high temperatures, or beam tests. We also have access to equipment in the Institute for Materials and Processes for small scale materials characterisation and the inspection of failure surfaces. 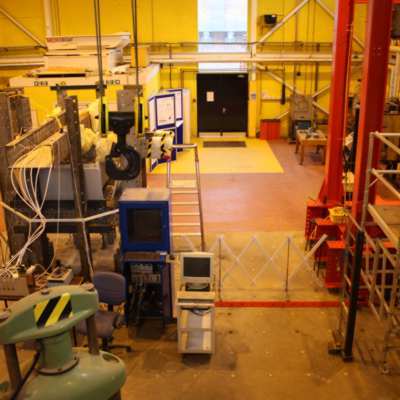 The lab is equipped with furnaces and ovens for structural testing under heat and fire. We have both electric ovens and a gas radiant panel system, which allow us to carry out bespoke structures in fire testing. We have modern high speed data acquisition systems, and an inventory of displacement, load, temperature and strain instrumentation. As well as conventional measurement methods we use digital image correlation for displacement measurement, structural health monitoring equipment, and non-destructive testing methods such as ground penetrating radar, acoustic emission and infrared thermography. The structures lab houses the Silos Gantry, used to test storage silos and to characterise granular flow.